Newbie to the 18SX. I would like to practice righting the boat before the inevitable big event occurs. What is the best way to pull the boat over to practice righting? My wife and I have tried pulling it over using the trap wires alas with no success (combined weight of ~ 270lbs). Can we use the main halyard for additional leverage or would this side torque be a problem on the comp tip? Many thanks! If the mast rotator is pointed towards the pull on the halyard, the comptip wouldn't be an issue. But if someone is pulling, they have a decent chance of being hit by the mast on the way down, unless you tied a much longer line to the ring shackle to get yourself out of the fall zone. If you lay it over without the main on, I would guess it would want to turtle fairly fast. So make sure your mast is sealed. Do a search for 'righting' on this Forum. Do you use a painter? We use a 15' x 3/4" line, tied to the dolphin striker. At the loose end, we have three knots, about 18" apart. (Easier to grip while righting). This acts both as our painter and as our righting line. We store it in the pocket at the front of the tramp. I also have another righting line rigged underneath the hulls, 1/2" line, and I'll email you some pictures of that one. (We used to use an old jib sheet as a painter/righting line, and found the line too thin to hold onto). When we capsize, do NOT let the boat turtle as you may need a power boat to right your Hobie. Don't ask how I know. The river we sail on can be very shallow.... so I sail with a Mama Bob as I have no intention of breaking a mast. Others have commented on sealing the mast, which is essential. OR use some kind of floatation device. Where do you sail out of? Many thanks for the replies. I've sealed the mast; however, I am concerned about turtling. Since I have the fiberglass comp tip I don't think a mama bob is an option as you can't rivet the bob mast to the fiberglass. Until my wife and I are more comfortable with righting I thought I'd hang a fender on the ring shackle to give some buoyancy to the mast - I'm sure I'll win some sort of award from the commodore of my sail club for this! I have a blue Hawaii righting line plus a painter on the striker. My biggest problem is being able to practice righting as we just can't get the boat over in light to no wind. Looks like I need to get a friend with a power boat as suggested. Again, many thanks! Righting in little/no wind can be tough. We found that any righting line that is bungee based is too difficult to control when standing on a narrow daggerboard, so we use a painter. Try it with a powerboat nearby, and explain to them the process ahead of your trial. All we needed last time was for the power boat crew to lift the tip of the mast 30" out of the water, and the rest was easy. At that time, if there had been wind and wave/chop, we could have 'rocked' the boat up. What is the best way to pull the boat over to practice righting? Another advantage to capsizing under sail... it gives you a good idea of how far over the boat can go, and what it's like to capsize, so you can prevent it in the future. Also note that, as John said, righting in little to no wind is actually more difficult than righting in moderate to heavy wind, and you may neglect one of the more important parts of righting, which is to turn the boat into (or about 45 degrees to) the wind. This allows you to use the wind to push on the trampoline, and help pick the main up out of the water. Practicing in no wind eliminates this aspect, for better or worse. My wife and I have tried pulling it over using the trap wires alas with no success (combined weight of ~ 270lbs). As was mentioned, be careful trying to pull the boat over that way, you don't want to end up under the mast, boom or main, or caught on the shroud when it comes over! Also, ~270lbs is going to be too light to right an H18SX. I've tried and failed to right my standard H18 with 270 lbs combined weight. Make sure you have a third body available nearby to help right the boat when you try it the first time, or a nearby powerboat to give you a hand. I had no trouble mounting my Mama Bob on my comptip... the instructions are clear and good. 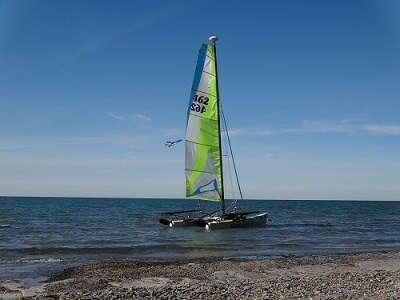 What SabresfortheCup said.... sail at ~ 90 degrees to the wind, let crew steer, you go on the 'wrong' side of the H18 on a trap wire, and the boat will gently go into a capsize. May sure you get back on the tramp in time. As the boat goes vertical, be sure both you and the crew have a solid grip on something.... hiking strap, hull, wing, something. On a normal cat, when you fall from the top hull, you go straight into the water. On a 18SX, you fall straight into a wing. Three years ago, my buddy fell backwards into the lower wing and fractured C-2 nearly severing his spinal cord when hit by a micro-burst..... he is fine now, thanks to his quick-witted crew and some good medical care. As the boat goes vertical, be sure both you and the crew have a solid grip on something.... hiking strap, hull, wing, something. On a normal cat, when you fall from the top hull, you go straight into the water. On a 18SX, you fall straight into a wing. That's right, I forgot that wings are stock on an SX... So no sitting on the side of the hull, haha. I imagine capsizing can get a little more hairy with those, if you're unprepared for it. Righting too takes a little more weight, I'm sure, to combat the submerged wing. That said, you will be surprised at how slowly the boat goes over in normal (non-microburst) conditions. If you remain calm, keep your head about you, and just make sure to grab on to something, like John said, it's really no big deal. Three years ago, my buddy fell backwards into the lower wing and fractured C-2 nearly severing his spinal cord when hit by a micro-burst..... he is fine now, thanks to his quick-witted crew and some good medical care. Wow! That's some really scary stuff there! Glad he's alright! Wow! Glad to hear that the capsize is pretty benign but, not happy to hear about a fractured neck. I've seen videos of jumping off the back side of the high hull after capsize which is easy enough without the wings. What is the best way to egress if wings are in place? I would think the helmsman can just jump to the stern but what about the crew who is sitting more forward on the wing? In regards to the Mamma Bob, I was told that riveting the Bob's aluminum mast to the fiberglass comp tip would not provide adequate purchase for the rivets resulting in a splintered comp tip when the Bob hits the water with a capsize. With the standard H18 aluminum mast this would not be a problem. I would love to make use of a Bob while getting used to the cat but don't want to ruin the mast tip when I go over. 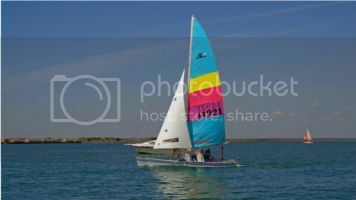 I'm primarily lake sailing in South Carolina but when more comfortable I would like to sail off the beach as well. Again, many thanks for everyone's help!! I guess we sailed for maybe 4 seasons without a capsize... clean running main blocks and 10 mm Robbline or Mafioli will do the trick, and allow you to release the main sheet very quickly. So then I mounted a spin, and this is turning out to be an ongoing and enjoyable learning experience. All three capsizes since then were related to spin mis-handling, and all were 'gentle'. as I remember as in a H16. My second biggest fear is that my 20 year old (he who wears the hiking harness) will fall forward into the pentex main sail.... and probably go right through the sail. Each time, he has managed to unhook himself and hold on to the top of the wing, then climb down. Just put my 18 on it's side for the first time. Went over with a beer in one hand and a smile on my face. (no, I didn't spill the beer and yes, I was badly unprepared at the moment). Found myself hanging from the wing like a monkey, not sure where to dismount. Ended up using my center lacing as a foot hold and moved aft until I could climb down the rear lacing entering the water between the tiller and wing. Used "fastfriends" righting bar(see his posts) without incident. I have a bob mounted to my comp tip but did reinforce it this year due to wear and tear on the fiberglass. I can tip my boat over by standing on my wing, grabbing a trap ring and lean out. Sounds like you have a great deal more finess that I do to do all that without spilling the beer! I wish there was a more elegant way to dismount with respect to the wings. That reminds me... buddies of mine used to sail an H18 with Magnum wings, and enjoyed themselves in high wind situations. However, sailing on a lake/river means that the chop has very short fetch, and often, they used to stuff the leeward wing into a wave. Always happens when you least expect it. That will stop the boat almost immediately, and skipper and crew might enjoy an unexpected journey to the bow. One consequence is loss of balance of the boat, and over she goes. They used to come ashore dripping wet, with bruises and very big smiles.